This is the perfect dish to serve when a regular salad sounds boring, but you still crave something light, fresh and nutritious. If you’re like me fish sometimes feels fussy and hard, but in reality fish cooks up really quickly and can be prepared very simply to let the flavor really shine on its own. Heat the butter in a skillet over medium-high heat. Season the salmon well with salt and pepper. When the skillet is really hot, place the salmon skin-side down in the skillet (you want it to sizzle as soon as it hits the pan). Cook for 6 minutes on the first side, flip and cook for an additional 1 1/2 minutes. Cooking time may very slightly due to the thickness of your filet. Combine all ingredients in a blender and blend until smooth. Taste and adjust seasoning as necessary. 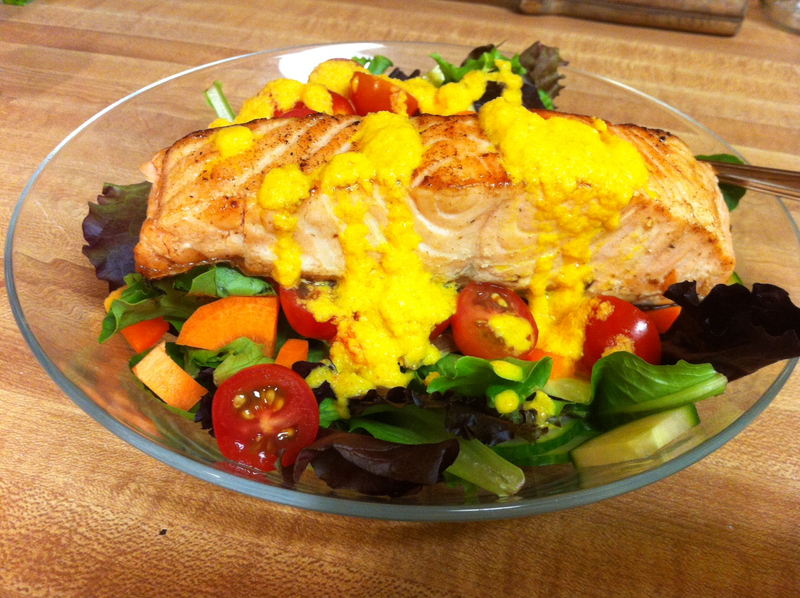 Top a salad with the salmon and dressing. Enjoy!